Just started to use UMLet to design a music-related database-driven application in Lazarus free pascal. I am very impressed with UMLet's intuitive user interface. It has enabled me to generate a suite of class diagrams at several levels of detail which exactly fit my needs. I am Macos Mojave user. Initially I downloaded the umlet-eclipse-p2-14.3.0.zip file, unziped and copied the com.umlet plugin version 14.3 jar file to the Eclipse plugins area but it did not work then tried to place in the p2 but it did not work.. After many attempts, I managed to install UMLet uml tool fast uml diagrams as suggested in marketplace and it worked. I created a Use Case diagram and saved it and closed Eclipse. I reopened Eclipse and tried to access my use case diagram and it hanged Eclipse and I had to force Eclipse closed. This hangs the Eclipse every time. I don't know what to do now as this is for my programming course in Australia. I have access to the error logs and I can send it if needed. Hi -- sorry to hear that, although unfort. we are not surprised.. First, it'd probably be best for you to use UMLet standalone on macOS, or if you only need very light-weight diagrams, the online version at www.umletino.com. We are aware of an Eclipse plugin issue on macOS, but we have been unable to track it down, as the logs do not seem to point to the core issue here; we suppose it's an interplay with Swing. It usually happens with multiple UMLet windows open. I cannot get an editing cursor to appear in the lower right window where the attributes of a class are supposed to be edited. When I click on a line, I get a yellow line highlite, and no cursor. When I type nothing happens. I am on a clean Oxygen install on OS X. Not useable at this point. we'll try to replicate this; given the large # of combinations of OS, Eclipse versions, and Java versions, such issues are tricky to test comprehensively. OS X & latest Ecl version is always a hot candidate for some mess-up. Feel also free to directly notify us of such bugs via email. I am using Eclipse Juno. The installation worked well. After downloading the .zip file, copying it to the eclips plugins filder and restarting eclipse, I was able to draw my first diagram. It seems to work well. with out downloading option, is this really useful? I didnt see any download option. Why isn't there a strict rule for marketplace that requires any plugin listed here to provide these? Horrible user experience. A few comments to outline our view on this..
We have implemented an install icon and released it about two months ago for a few days, but hit some compatibility issues. After a relatively quick check did not result in a fix, we abandoned this thread for the time being; we want to focus on the tool itself, instead of its surrounding infrastructure, as our time is limited. But no excuse here, we just stumbled over some technicality, and, being lazy, did really not enjoy digging in. On a more general note, I personally am not a very big fan of this drive towards "user friendly" install overheads; I personally dislike installers in general; am not fond, e.g., of the "virtual drive downloads" on OS X for many tools (why the extra layer? ); and am bothered by how many plugins seem to hide/forget their simple basic package downloads in favor of update sites/drag-and-drop buttons etc. As for the latter, if you use Eclipse over X-Windows, or Eclipse on a server farm without internet access, these "helpful" installation methods won't work, might send Eclipse (and other tools) into a non-stop and futile internet lookup; and require relying on the old school package download anyway -- if that way is neglected or unsupported, the whole exercise becomes excruciating fast. In short, in many instances I like to download what I want directly, and in the version I choose, and start it right away. But I am aware that that's a very personal take on all this, and largely gut-driven -- we will in fact look into install support down the line again, and hope to then put this to rest. Try to download this for my Eclipse, but download button not available. It's also not possible to find the tool via the marketplace in Eclipse. How can I get this tool? Easy to use, complete and free! Great tool, I'd recommend it to any level (beginner to pro). Nice and helpful. easy to use and fast. This tool is great once you get started... Great job for the people who made it possible to use if open source. This tool is enough to make fast simple & nice documentation. To install the plugin just drop the jar into the 'eclipse/plugins' folder. This is an outstanding, lightweight tool for quick UML markup. This is the perfect tool for someone that is a developer, not a business analyst, and when just needs to quickly diagram some knowledge to add to a story or wiki. I've used mostly Visio in the past but was looking for something open-source and Linux-friendly without all the bells and whistles, this is exactly what I needed. No need for over-loaded UML applications, this tool fits the bill nicely. There's no download button. I created an account and logged in but still no button. Simplistic approach at UML designs and very light weight, loving it. Am using as stand alone without eclipse integration, it makes navigation and reference lookup on code very much comfortable. How to install it in eclipse. There's no install button for this add on. UMLet makes going back and modifying diagrams so easy! It's a simple and powerful tool. - Line tools like the "has a" and "is a" always get copied behind to the back layer, this is EXTREMELY frustrating when trying to align new elements up. Why would you ever want to copy a new object to the back z index? You can right click and change the layer to bring it to the front, but this just destroys the whole flow and experience. - Its a bit tricky to grab and move the smaller elements as the grab handle for elements is relatively small. - It takes a bit of getting used to, but ctrl selecting is used to lasso objects where simple clicks move the screen around. I understand this is more of a preference but I find it much nicer to select lasso with a simple click and use the ctrl + mouse to move around. - When double clicking on elements (this duplicates them), it sometimes places itself at the end of another line segment automatically attaching itself to that line or connector. This means I have to either copy and paste (Which can have the same effect depending on the area of the screen, forcing me to move the screen so that the upper left corner is free (where the new element gets pasted)) or create one from the elements palatte. Other than that, I really do like how fast I can make beautiful custom UML diagrams with little effort! Easy, fast and useful! Excelent!! It will take a little to learn the fields you can add to the "properties" for each UML element but once you understand how it works it is so easy to get the job done! What the heck?? Is this no longer available? I'm logged in but now apparent download link. nice and easy to use tool. export feature is very helpful. Instantly works. Very good for rapidly drawing ideas. I use it regularly for producing documentation with UML diagrams inside. In order to avoid multiple rastering defects in drawings, I use the SVG export and automatically transform the .svg files to .odg (OpenOffice Drawing and Graphics) by svg2office-1.2.2.jar. The result looks very clean. Inside OpenOffice it looks not yet good, as this uses only the EPS preview. Then print the document to a PDF printer (Do not use export!) and you will have the diagram in high-quality vector graphics in the PDF. This is the best way to quickly sketch out diagrams! By focusing on the content the tool lets to experiment quickly and does not slow down the thinking. Other tools do not come close (well maybe SDEEdit for sequence diagrams). I love custom elements feature too, very powerful! A good alternative for dia. Especially with the support for properties of the elements. A little awkward to use, but you get used to that quickly. Without correct z-ordering my diagrams look ugly. There is z-order support via the "layer=1,-1,2,-2.." command, but a bit tricky to find; v13 will have context-sensitive help in the panel, and maybe element context menu entries for layering. v13 will also allow more transparent element type handling, including on-the-fly changes between similar elements. "fields for different properties" (if I understand correctly) are unlikely to come; we prefer the single text panel approach to pop-ups, separate fields, and any other interface elements that restrict free text flow and UMLet's copy/paste logic (if I interpret this point wrong, let info@umlet.com know). Finally, all elements are transparent by default; we might look into opacity in the future. I'm not sure why anyone would download this after seeing the developer's website. The sole purpose of the site looks to be tricking people into accidentally clicking on one of the many sketchy camouflaged advertisements. I can quickly start drawing from the palette. The number of features is huge. Always adding new features. Very intuitive. Can even create my diagram elements. Even though this tool does not promise to generate your application by creating a simple diagram, at least, it works! You can create UML diagrams in very little time. how to install this hell plugin? it became so annoying , what is the instruction to install it? Did you google it before asking? There are many free UML tools out there many of them don't even work. This tool does. Great free tool for putting together a quick diagram to include in your design docs. The hardest part is figuring out how to download the plugin. It would be great to have an install link right on the Eclipse Market Place. I get the fact that they are trying to make some money to support the project by putting links to SPAM ware on their site but it would be nice if they were a little clearer about what you are downloading when you click on one of the large Download links. To get the actual UML tool you have to ignore the huge green buttons to download various SPAM ware products and click on a small download link in the middle left of the page. As far as the actual application The User interface is a little different but with a little practice you can get the hang of it. It prints diagrams well and allows you to export them to many different graphical formats. 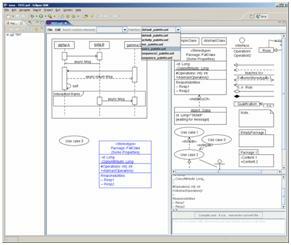 A great tool for doing some quick UML diagrams but probably not the right tool for doing a large UML model. PS This is the best UML tool because others including papyrus and omondo uml are unusable, probably this is a problem of GEF, which they use as their base. I use UMLet since the TogetheJ was destroyed by Borland. For more than 8 years UMLet is the best solution. This is by far the best UML modeling tool I've ever used, it compares well with (and in many ways it overtakes) other ineffective, costly and cumbersome programs. It's easy to use, standard compliant, lightweight and free: what else can we ask? Thanks a lot guys, great work!